The inhabited large island of Åland (Fasta) (local name Ahvenanmaa) is part of (the island group) Åland Islands and is located in the country of Finland, Northern Europe. The distance to the mainland is about 44.3 km. The nearest (main) land is Sweden and is not the country to which the island belongs. The surface-area of the island is 807.8 km2 and is therefore 2.1 x times greater than the island of Isle of Wight. The island lies in the Gulf of Bothnia and the total coastal length is about 849.2 km and the dimensions of the island are approximately 60 km by 40 km (maximum width). The island is West-northwest - South-southeast oriented. The highest point is 129 meter and is named Orrdals klint 129 meter. The coordinates (latitude, longitude) of the island (center) for GPS are 60.26 (60°1'32.0736), 19.94 (19°56'24.5076). The population is 28065 and the population density is thus on 18.1 inhabitants per square kilometer (compared Isle of Wight 364 inhabitants / km²). The capital of the island is Mariehamn (located in the South of the island). Other places on the island are: Godby (M). The island is located in the South-southwest of the country Finland. 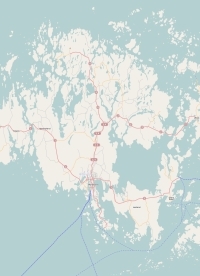 It is located in the administrative unit Region Åland (local administrative level-name maakunta), in the municipalities : 1) Jomala 2) Hammarland 3) Eckerö 4) Finström 5) Geta 6) Saltvik 7) Sund 8) Lemland 9) Lumparland 10) Vårdö 11) Kumlinge 12) Brändö 13) Sottunga 14) Föglö 15) Kökar (local administrative level-name Kommun). The island is accessible by car (by means of ferry or bridge). The distance from Western-Europe (The Netherlands) is about 1677 km. There is a ferry connection for cars to the mainland. For pedestrians, there is a ferry connection to the mainland also. Far as is known, there are good cycling opportunities on the island. average score: 3 from 1 votes.